The geographic centre of Toronto. In 2010, our pals over at Londonist set out to find London’s true geographic centre. Their experiment got us thinking about Toronto’s centre, and how for most Torontonians (Torontoist included) the city’s symbolic heart is somewhere downtown—at an intersection like Bloor and Yonge perhaps? But while downtown Toronto is the city’s cultural, financial, and political epicentre, it’s firmly in the south end and nowhere near Toronto’s true midpoint. To find Toronto’s actual centre we first tried Londonist’s method, which involved cutting out a map of Toronto, gluing it to a piece of cardboard, and then finding its centre of mass by balancing the cutout on a pencil. We tried this method twice, and got two, fairly different results. Next, we tried what’s called the plumb line method [PDF], which again involved cutting out a map, only this time we found the object’s centre of mass by hanging a string with a weight on it from three different points along the cutout’s edge. We then traced the different paths formed by the string on the map and marked where they intersected. This method produced more accurate results, but we still weren’t satisfied. So we decided to go to a pro, and enlisted the help of Marcel Fortin, a Geographic Information Systems and Maps librarian at the University of Toronto. 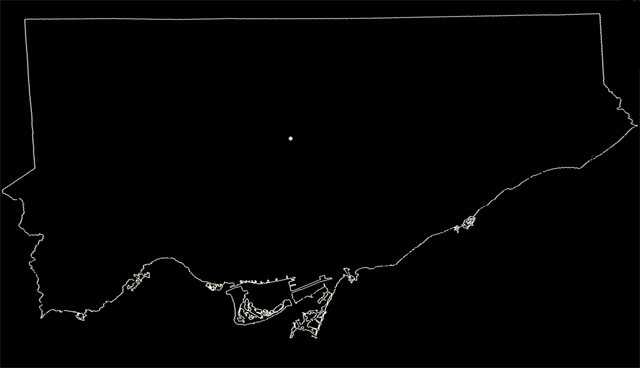 Using Statistics Canada’s border data for the city and a GIS mapping program called ArcMap, Fortin transformed the area within Toronto’s boundaries into a polygon, calculated its centroid, and then plugged those coordinates into Google Earth. Before we reveal the results, we should note that the method we used is one of several, and that different techniques and data sources can lead to different results. For instance, the City of Toronto’s ward definitions produce a slightly different centre than Statistic Canada’s, as the ward borders include some of the water between the Toronto Islands and the shore. Ultimately, we chose to use Statistic Canada’s border data, as it contains the fewest anomalies and doesn’t include parts of Lake Ontario. 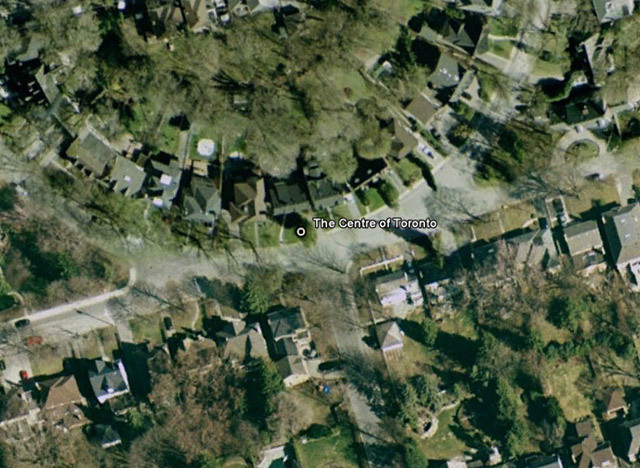 33 Wanless Crescent, Toronto’s geographic centre. Image from Google Earth. Lawrence Park! Or more precisely, an island of cedars in the front lawn of 33 Wanless Crescent, the home of Bill and Judy Haust. “I’m stunned to find out that we’re at the centre of the universe,” Bill told Torontoist when we presented the Hausts with the news. “Frankly, it’s something we would never even have thought about,” continued Judy. 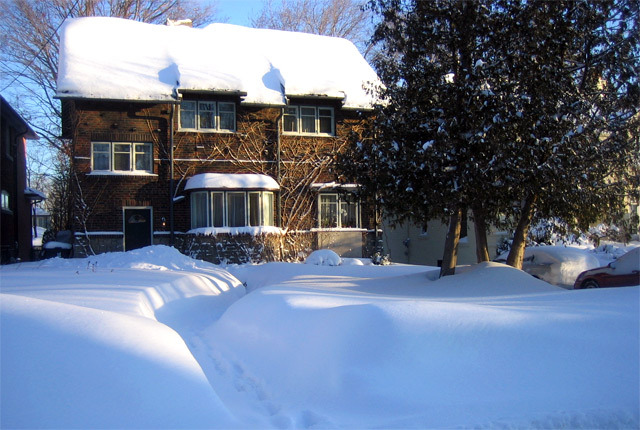 33 Wanless Crescent. Photo courtesy of Bill and Judy Haust. 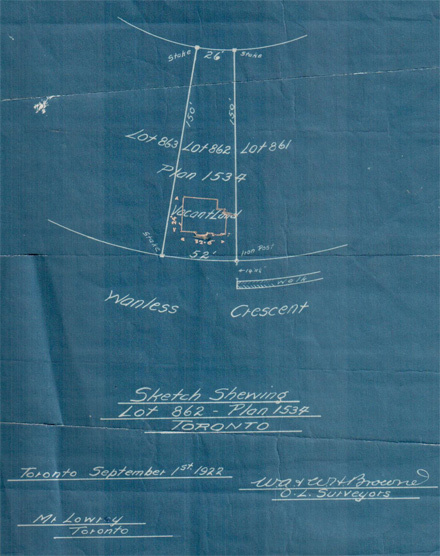 According to the original architectural plans, 33 Wanless Crescent was built between 1922 and 1923 by a Mr. Lowrey during Lawrence Park’s first wave of development—back when the area was still advertised as a refuge from “the Lake Winds in Winter.” Judy’s parents then bought the house from the Lowreys in 1952, and Bill and Judy purchased the property from Judy’s mother in 2003. The original architectural plans for 33 Wanless Crescent. Image courtesy of Bill and Judy Haust. Of course, we aren’t the first organization to make a claim about Toronto’s centre. The Ontario Science Centre argues on its website that it’s “smack in the geographic centre of Toronto.” However, when we contacted the Science Centre, they were unable to back up their assertion with any proof. Toronto Suites Apartments also suggests that it’s “situated in the geographic cent[re] of Toronto.” But, as we previously discovered, developers and landlords seem to think that half the city is at Toronto’s heart. Now that we’ve solved the mystery of what’s at Toronto’s true centre, we’re keen on taking on another geography-focused assignment. We don’t want to overpromise—the mapping software can only use existing, available, and reliable data sets (think population centre rather than coffee shop concentration), but there are all manner of geographical queries we can try to sort out. So dear Torontoist readers, what should our next mission be?